This huge aircraft was the largest aircraft in the world when it was first built. The C-5 has a tremendous payload capability, thus providing for the Air Mobility Command in support of United States national defense. The Lockheed-Georgia Co. delivered the first operational C-5 in June 1970. In March 1989, the last of 50 C-5B aircraft were added to the 76 C-5A's in the Air Force's airlift force structure. The C-5 is still one of the largest aircraft in the world. It can carry outsized cargo intercontinental ranges and can take off or land in relatively short distances. The C-5 is similar in appearance to the C-141 Starlifter, but the C-5 is much larger. Both aircraft have the noticeable high T-tail, 25-degree wing sweep and four turbofan engines mounted on pylons beneath the wings. Four TF-39 turbofan engines power the C-5 Galaxy. The engines are pylon-mounted and rated at 41,000 pounds thrust each. They weigh 7,900 pounds each and have an air intake diameter of more than 8.5 feet. Each engine pod is nearly 27 feet long. 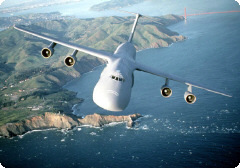 The C-5 is able to take off fully loaded within 8,300 feet and land within 4,900 feet. The aircraft also has twelve internal wing tanks with a total capacity of 51,150 gallons of fuel. With aerial refueling, the endurance of the crew is the only limit to the aircraft's range. Page rendered on 25 April 2019 at 00:38:58 in 298.977 microseconds.